Wow, I can’t believe it’s been two weeks since my last post. I promised myself I would do a better job of keeping up my blog, but between school and work, there never seems to be enough time in the day. And to be honest, there are days my head is swimming and I feel drained. Writing complete sentences is sometimes beyond me. As I write this it is 8pm. I got home at 5. Where does the time go? Memorial Day weekend I meant to write a post actually two, but it was my birthday and my family decided what I needed was a big two day celebration. What I needed was to forget about it; this is my last year in the 40’s digits and I wanted to mourn them. So, because I was not allowed to have a pity party I made the best of it. This was to be my year of birthday books! It’s funny, my family always asks what I want for my birthday, and I always roll my eyes; hello, I’m a reader, what do you think I want? 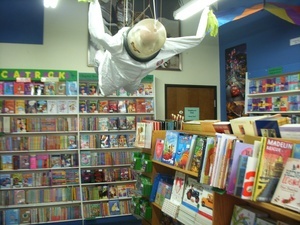 I mentioned to my son that I thought it would be fun to spend some time in a funky used bookstore. He took the hint (finally) and mapped out a couple of bookstores he thought would suit my needs. We met up early in Reno and hit the town! I’ve always meant to go into Zephyr Books as it’s not far from my son’s home. But every time we stopped by for one reason or another they were closed. On this day we lucked out, they were open. Our bad luck was that they were going out of business. But, hey, all of their hardbacks were $2.00. What reader wouldn’t melt at this news? I sauntered in ready to spend some money! On the outside the bookstore looks like a dive. It is (was) housed in an old strip mall on the edge of downtown Reno. I am sure at one time this was downtown, but now it’s mostly ethnic restaurants and tattoo parlors. The inside, though, oh, was amazing! Tardis like amazing! It was much bigger than it looked. In its glory it must have held thousands of books. Sadly it was very picked over, but I still managed to find a couple of gems. The owner told me she was retiring, well not really retiring, she is now playing the violin in the Reno orchestra. I asked if she had tried to sell the bookstore; after all, it was huge and obviously had a large clientele. She said yes, and was sad to find no takers. My heart sank. A few years ago I was in the position to buy a business and have a go at it; I’ve owned a store before, and it is a dream of mine to own a bookstore, but in this economy there is no way I could risk it. We chatted awhile and she was kind enough to give me the names of a couple of little known bookstores. I’m going to seek them out on my next visit to Reno. Grassroots Books is in an even worse location! How anyone stumbles upon it is beyond me. Surly they are in business only by word of mouth. I was very dubious when we pulled up to a small white warehouse looking building, tucked behind two car lots. What could this small rundown looking store have to offer? Well again I was shown looks are deceiving. Walking into Grassroots was like coming home. The walls are painted a bright sky blue, making the white shelves really stand out. Not an inch of space is wasted in this store. I found books stacked on the floor, on chairs and on tables. The clerks must be art students, as they had done a wonderful job displaying books with the brightest covers. You get a sense of carnival as you pick your way through the isles. 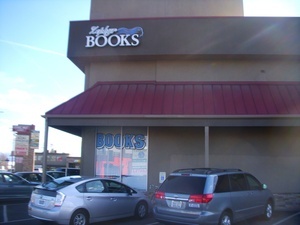 In order to really convey the experience I have to tell you about another bookstore, one I used to haunt in California. 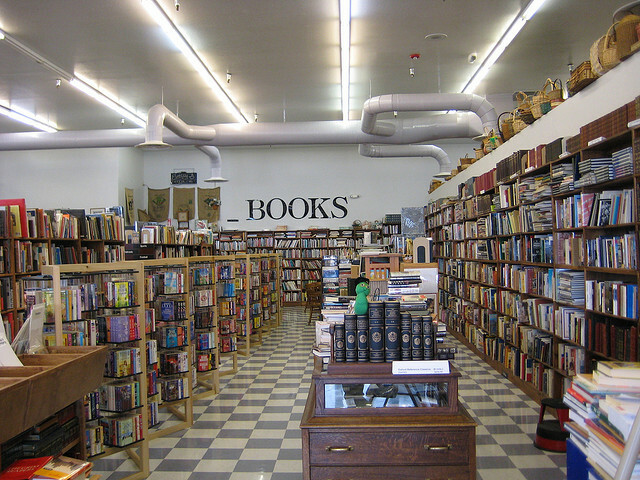 Treehorn Books is in the middle of downtown Santa Rosa. It is still in business and it’s the first place I hit when I go back home. It holds a sense of wonder for me. In the 80’s I went on a regular basis and no matter what I was looking for, I always found it at Treehorn Books. If someone mentioned an obscure book, I’d find it there. When I was studying Buddhism, I’d go to the store and start looking in the religious section, and I kid you not, a book would fall from the higher shelf and lo and behold it was a book in the exact subject I was looking for! I never walked out of there empty handed. Once I asked if they had heard of Stephen King’s My Little Pony (a hard book to find in those days). Not only did they have two copies, one was signed by King! If there were a used bookstore in Diagon Alley it would be Treehorn Books. So there I am in Grassroots, and in every section I explored, I found a treasure. They have a medieval history section! No used bookstore I have ever been in has one of these, yet here it was, my favorite time in history. I cruised the fiction section, looking for something, anything to grab my attention when I spotted a lone book, as if someone picked it up and decided not to get it. The title “My Life with Corpses” made me pick it up: This alone was worth buying it. As I stood there marveling at such a large selection in such a small space, I wondered if they would possibly have Salman Rushdie’s Satanic Verses in hardback. I have yet to see a used one. They had three!! This is my new favorite bookstore. I ended up coming home with 11 books and had an Amazon package waiting for me. A couple of days earlier, JoinBunch, decided to award me with a $200.00 gift certificate for my hard work and dedication to the site. Of course I had to use some of it, right? After all it was my year of birthday books! My son gave me Neil Gaiman’s Unnatural Creatures. Previous Previous post: Proof of Dreams?